Hana Financial Group, South Korea’s third-largest banking group, said Tuesday that it has partnered with SK Telecom and Kiwoom Securities to take aim at forming a new internet-only bank here. 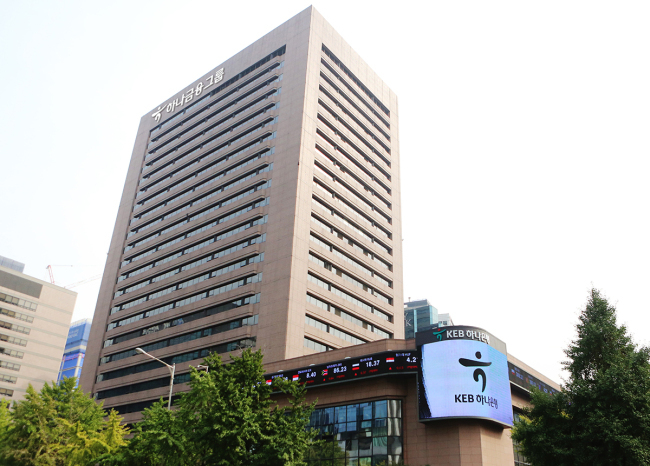 The three companies have formed a consortium with Kiwoom Securities holding the biggest stake. Together, they are embarking on preparations to apply for a government-issued license to operate an online-only bank here, according to Hana Financial. The move comes as the firms seek to further embrace the digitalization of finance and the immense potential in an internet bank based on new information and communication technologies, as well as big data and artificial intelligence capabilities. Hana Financial said it has been leading efforts to bring digital technologies into financial and banking services, announcing its “digital transformation” vision in October last year. Hana was the first Korean banking group to adopt a smartphone banking system. KEB Hana Bank has also partnered with mobile messenger Line to establish Line Bank, a digital bank, in Indonesia. Other tech-driven creations include the blockchain-powered Global Loyalty Network system and Finnq, a finance lifestyle mobile app co-created with SKT. Likewise, SKT, the country’s biggest mobile carrier, has been stepping up efforts to expand into new technology segments including autonomous driving, quantum cryptography, artificial intelligence and new media. Such tech capabilities will play a hand in building efficient, innovative and user-friendly online banking services, it said. Meanwhile, Kiwoom Securities is considered a success case of transitioning securities trading services to the online realm. It has been the top-used online securities firm with the highest number of users for 14 consecutive years, it said, citing confidence in its readiness for operating an internet-only bank. The Financial Services Commission is set to grant approval for two more internet-only banks next month, following a new regulatory change to ease ownership rules for online banks here. Currently, Korea has just two internet banks: Kakao Bank, operated by mobile messaging giant Kakao; and K bank, run by local telecom provider KT. In addition to the Kiwoom-Hana-SKT consortium, Shinhan Financial Group and Viva Republica, which runs Korea’s leading mobile money transfer app Toss, have also announced intentions to seek an internet-only bank operational license. The FSC plans to accept applications on March 26 and 27. It will undergo a review process in April and May, with plans to announce a tentative decision in May. Under this timetable, new internet-only banks could start operating as early as June, according to the FSC.